This year marks the centenary of the 1918 influenza pandemic, the worst flu outbreak in recorded history. A new study into the human, viral and societal factors behind its severity provides valuable lessons that could save lives in future pandemics. Publishing in Frontiers in Cellular and Infection Microbiology, the authors warn that while the world is better prepared than 100 years ago, new challenges will affect the impact of the next influenza virus pandemic — including changing population demographics, antibiotic resistance and climate change. 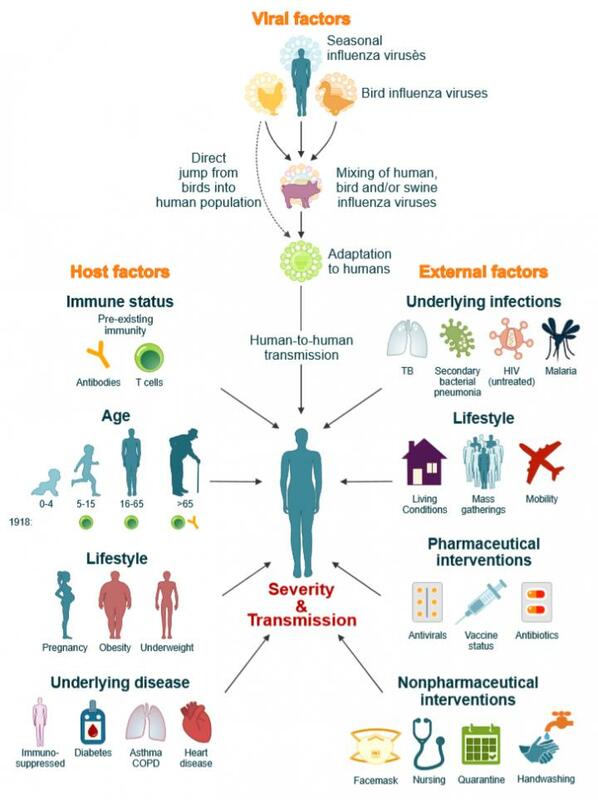 The severity and transmissibility of pandemic influenza viruses are the result of a complex interplay of viral, host and external factors. We have come a long way since 1918 and pandemic preparedness programs have learned from the 1918 and later pandemic outbreaks. Although unlikely, we cannot exclude the possibility that an influenza pandemic with similar severity will repeat itself in the future. However, lessons learned from the 1918 influenza pandemic will ensure that we are better prepared. “We’ve seen three additional influenza pandemics since 1918: the 1957 ‘Asian’ flu, the 1968 ‘Hong Kong’ flu and the 2009 ‘swine’ flu. Although milder than the 1918 pandemic, these highlight the constant threat that influenza virus poses to human health,” says University of Melbourne Professor Katherine Kedzierska of the Peter Doherty Institute for Infection and Immunity (Doherty Institute), Australia. The 1918 influenza pandemic infected a third of the world’s population and killed 50 million people. However, many people managed to survive a severe infection and others displayed only mild symptoms. “We always wondered why some people can effectively control viral infections while others succumb to the disease,” says Kedzierska. To investigate this — and why the 1918 outbreak was so virulent — Kedzierska, van de Sandt and Dr. Kirsty Short of Australia’s University of Queensland reviewed a large number of influenza studies. One explanation for the pandemic’s severity is the viral strain itself. Some studies show the 1918 virus could spread to other tissues beyond the respiratory tract, resulting in more widespread damage. In addition, the virus had mutations that allowed it to be more easily transmitted between humans. Unlike in 1918, when the cause of influenza was unknown, scientists today can evaluate the pandemic potential of new viruses, both in animals and once a strain has crossed into humans. But, as the authors point out, such surveillance efforts are required across the world — a factor that will become even more important with continued climate change. “Climate changes affect animal reservoirs of influenza viruses and bird migration patterns. This could spread viruses to new locations and across a wider range of bird species,” says van de Sandt. The authors identify public health as another important factor. In 1918, people suffering from malnutrition and underlying diseases, such as tuberculosis, were more likely to die from the infection. This is still relevant today: climate change could result in crop losses and malnutrition, while increasing antibiotic resistance could see bacterial infections becoming more prevalent. Future pandemics will also face the challenge of obesity, which increases the risk of dying from influenza. Population demographics also play a role. Strangely, one of the most severely affected groups in 1918 was one that is usually resilient — young adults. The researchers think older people may have been spared due to previous exposure to other viruses, giving them greater immunity to the 1918 viral strains. However, given that seasonal flu typically kills the very old, today’s aging population will likely be another challenge in any future pandemic. “Providing emergency vaccines during future pandemics should take in account different age groups, viral and host factors,” says Kedzierska. The researchers also report that basic methods to reduce disease transmission, such as banning public gatherings and hand washing, helped to reduce levels of infection and death during the 1918 pandemic — but only when they were applied early and for the entire duration of the pandemic. If a similar pandemic occurred today, scientists estimate the death toll could be as high as 147 million. While it is impossible to know when or how the next flu pandemic will emerge, one thing is certain — future pandemics won’t be exactly like the 1918 pandemic, but it still has lessons to teach us.